The Zeiss inverted microscope has brought the cellular world to life, thanks to three well-known units in the Zeiss microscope family. The Primo Vert, the Axiovert 40, and the Axio Observer are three inverted models that have changed how science looks at the microscopic world. The inverted microscope was first invented by J. Lawrence Smith in 1850. An inverted microscope looks a bit strange to people who have never seen one before, because the light source and condenser are positioned above the stage pointing down and the objectives and turret are below the stage pointing up. Additionally, the stage on an inverted microscope is typically fixed into position. The objective lenses move along an x-axis in order to focus the image. The lens is brought closer or moved back with dual coarse and fine knobs. Why the switch from a standard microscope design? Inverted microscopes lend themselves well to observing living cells or organisms, especially those in any type of liquid. These specimens can be viewed in more natural environments in larger containers than traditional microscopes. The space above the specimen can also be utilized for manipulation applications and any required tools. 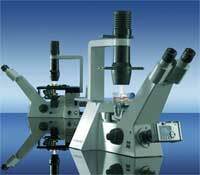 Zeiss inverted microscopes were designed to meet the needs of researchers and biologists. 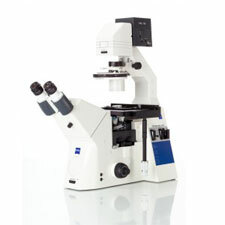 Each model offers its own unique features, so there's an appropriate inverted microscope for almost any application. The Primo Vert model works well when a quick and efficient check of living cells is in order. It is used heavily in genetics, cell biology, cancer, and HIV research. This Zeiss inverted microscope has great optical quality, is easy to use, and looks good too. One can purchase the Primo Vert with either a binocular tube, a binocular photo-tube, or a monitor. It also has features like an automatic light switch-off, universal phase slider for all types of objectives, and a modular illumination. The modular illuminator can be either LED or halogen. This model is also comfortable to use. It can be operated by multiple users without ever having to adjust an eyepiece, as the LCD monitor can be moved to accommodate any height. This makes it easy to walk by the Zeiss inverted microscope and check your progress. Users don’t even have to remove their glasses. The Axiovert 40 is another unit that is making a difference in the laboratory. This microscope has a 35-watt lamp, which improves the brightness in transmitted light no matter what contrasting technique is used. The bulb can also last for over 800 hours. Additionally, it has a three-position reflector mount to eliminate more stray light. This feature improves the overall contrast. The filter sets can also be changed with a click of a button. It can even deal with thin specimens. There is a bright field for naturally colored specimens and a phase contrast for colorless specimens. The PlasDic technology offers excellent contrasting among any specimen, even the thicker ones. The Axiovert 40 is a great inverted microscope because it is versatile and comfortable to use. This unit can accept any size vessel while letting the user observe it in a comfortable upright position. It is also easy to switch between putting the specimen in place and looking at it through the microscope. The final Zeiss inverted microscope that should be part of the discussion is the Axio Observer. This model yields a homogenous background. It also uses fluorescence technology to produce better contrast quality, and blends negative and positive phase contrast into one objective lens. The Axio Observer was designed to be flexible and adaptable in the laboratory. It can be upgraded and reconfigured in order to meet the needs of any project. Whether it is the addition of a high-speed cell observer or a TRIF system with space saving slider, the Axio Observer can be altered as needed. The Zeiss inverted microscope comes in several forms. Yet no matter the name or design, an inverted microscope from Zeiss still means quality, function, and flexibility. These are models that can keep evolving with the ever-changing scope of the scientific world.